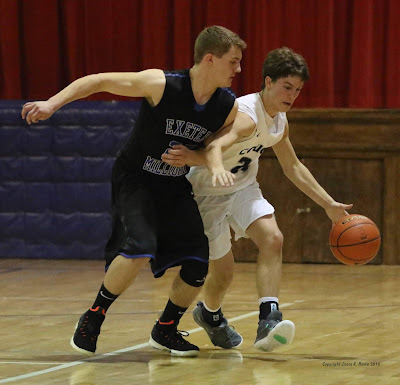 Exeter-Milligan boys beat Cross County Friday night in a triple overtime game 64-60 to take third place at the Crossroads Conference Tournament. 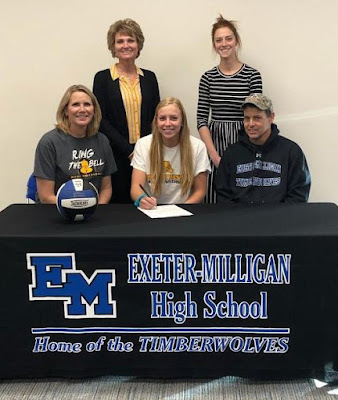 Art is in the Air! 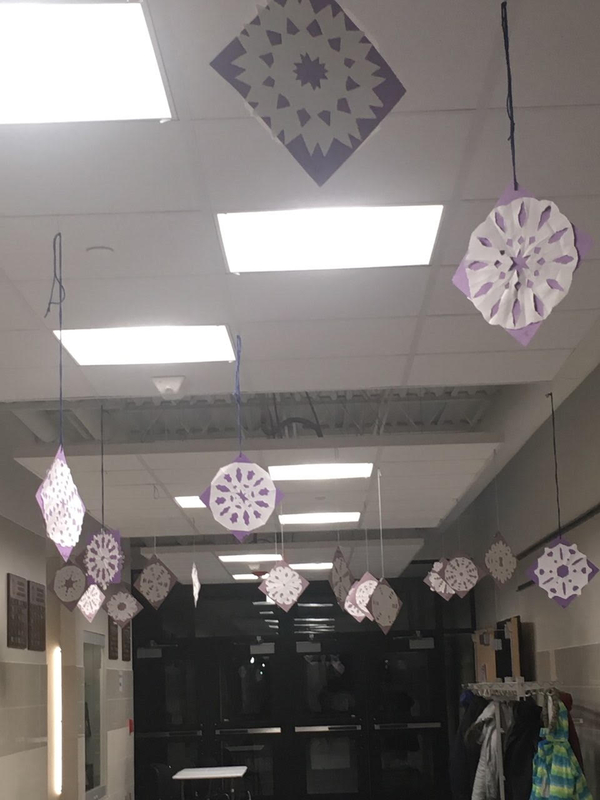 No literally, K-4th graders at Exeter-Milligan have made and hung snowflakes from the hallway ceilings to get ready for their “Winter Wonderland” music program. They all enjoyed learning to fold, draw and cut a radial symmetrical design to resemble a snowflake; no flake is alike! The Kindergarten- 6th graders enjoy art with Mrs. Kanode one time a week for 40 minutes. In that time they work on technique, fine motor skills, mediums to use and their own creative ideas. 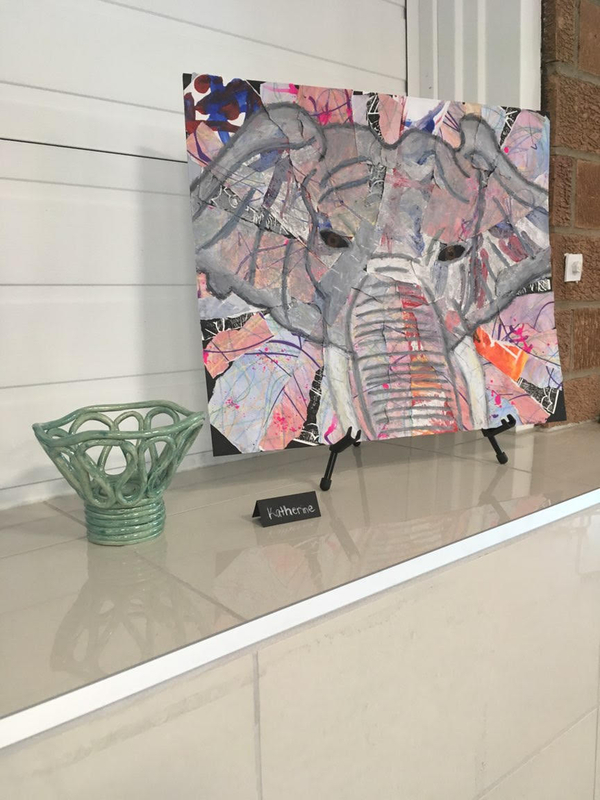 If you walk the halls of E-M you will see anything from textured teddy bears by the 1st graders, to contour line drawings of a bicycle painted by the 6th graders. The 4th graders have also worked hard on a Native American Painting that they actually fold up into a “parfleche”. This project works across the curriculum as it ties in with their Social Studies. 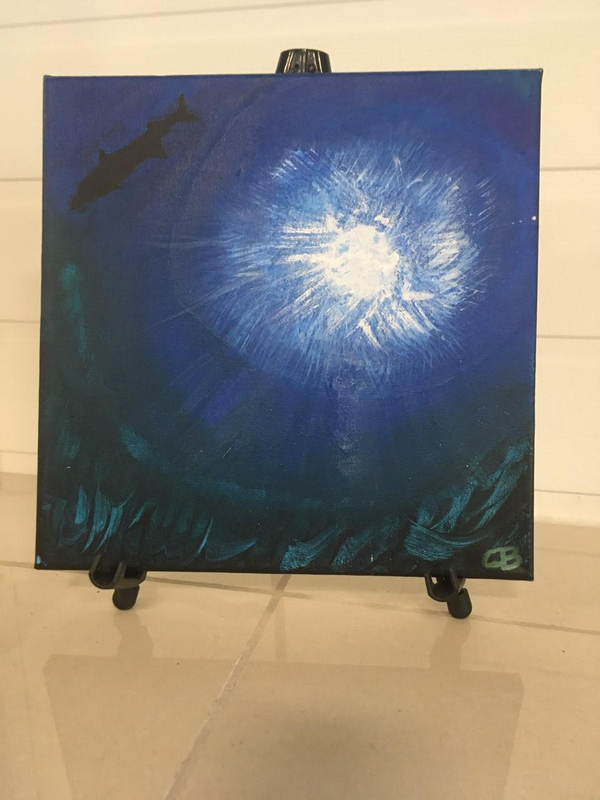 The 7th graders have been fortunate to have art 3 days a week for the entire semester this year which has really allowed for them to get a wide range of mediums and styles of art to work with. They have created Optical Illusions as well as Pop Art. They are currently turning using their imaginations to make a creation from a tessellation shape they have designed. However, I believe they will all tell you working with Clay is most of their favorites. The High school art classes range from 1st year to 4th year students. They have spent the semester working with clay, paint, pastels and pencil and they are wrapping up the year sharing artist presentations they have researched about an artist they choose. With this presentation they also have to create a reproduction of one of their art works. 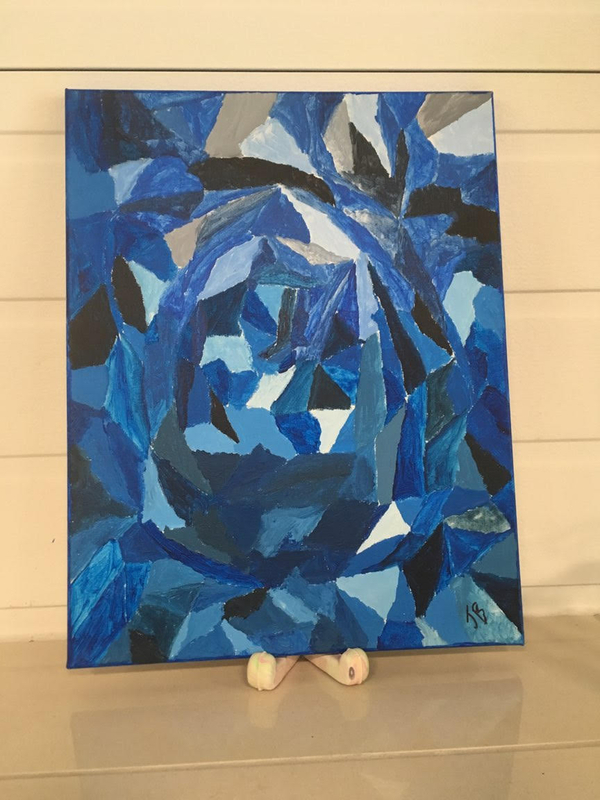 One student has found an artist that paints with many things, in his reproduction he is creating a large portrait of a soccer player by using a soccer ball instead of a paintbrush. It is proving to be more challenging than you would think. 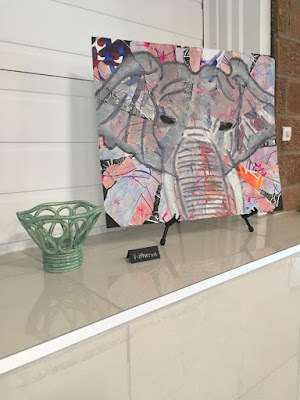 A few others are painting on canvas, using chalk pastel pencils or sculpting from popsicle sticks. We are learning about art from the Renaissance, with Leonardo DeVinci, American Artists, Grant Wood and Georgia O’keefe; Abstract Expressionist, Paul Klee and Gene Davis and two contemporary artists, Arthur Braginsky and Red. Laura Steuben’s 3rd graders at Exeter-Milligan are shopping at the “School Store”. 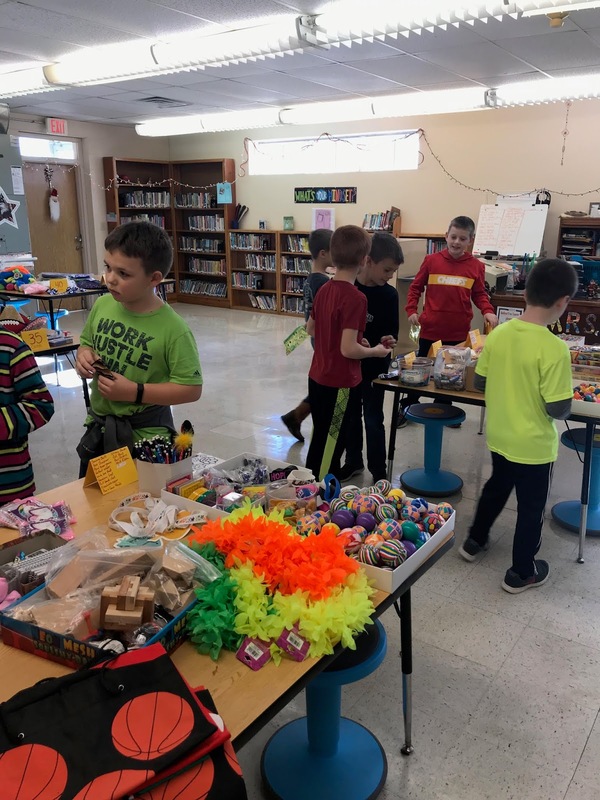 Student’s earn coins for academic and character trait successes and have the privilege to shop at the store once a month. Some students prefer to save their coins to purchase a big item. The School Store not only is a way to reward students but it teaches them how to count money, budget and save. The students were offered a deal this month with five coins off any item that cost eight coins or more.